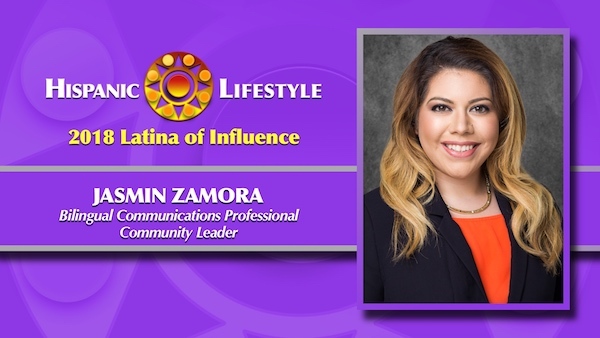 Hispanic Lifestyle is pleased to recognize communications professional and community leader Jasmin Zamora as a 2018 Latina of Influence. Ms. Zamora along with our entire list of 2018 Latinas of Influence are invited to participate in Hispanic Lifestyle’s 2018 Latina Conference taking place April 4 and 5, 2018 in Ontario, California. First Generation Latina, Jasmin Zamora has lived through the importance of appropriate messaging within cultural, professional, and public settings to ensure the effectiveness of broad communications. Her influence across nonprofit and corporate communications has allowed her to find passion within content creation that aims to drive results. Whether impacting employee engagement, Latino marketing, storytelling, or call-to-action communications, she knows her audience and how to draw them in. Though her expertise lies in internal communications, Jasmin has shown an array of inspiring content across various platforms.She currently serves as the Bilingual Communications Specialist for Combined Insurance, a Chubb Company. In her role, she also works to increase brand awareness through PR and community engagement efforts the in US Hispanic/Bilingual markets. Most recently, Jasmin become the founder and leader of the company’s first Latino Employee Resource Group, which works to serve its Spanish-speaking employees, sales agents, and customers. Additionally, she manages the company’s community relations program by overseeing charitable partnerships and organizing employee volunteer projects or community outreach events with notable Chicagoland and national organizations including—American Cancer Society, The Fisher House Foundation, Heartland Alliance, USO of Illinois, Casa Central, Hispanic Alliance for Career Enhancement, and more. Jasmin serves as a community advocate in and outside of her role. In 2016, she served as the Marketing Chair for Mujeres Latinas en Acción’s Young Professionals Advisory Council (YPAC). In her time as chair, she managed social media and marketing efforts for the council. In July of 2017, Jasmin was elected to serve as a Co-Chair for YPAC, which consists of more than 30 young professionals. She also serves on the board for Hispanic Alliance for Career Enhancement’s Young Professionals Board (HYPB) as the Marketing Chair. She has served on this board since July 2017 and manages the board’s external messaging. Jasmin was also recognized for her work in Public Relations and Communications at Combined Insurance in the Fall 2017 issue of Equal Opportunity Magazine. Jasmin was recognized for her work in Public Relations and Communications at Combined Insurance. Prior to Combined Insurance, Jasmin served as a Development and Communications Associate for a nonprofit in Northwest Indiana. In her time there, she managed PR and communication efforts. Jasmin holds a Bachelor’s in Journalism from Purdue University Northwest and currently resides in Chicago. When not out in the community or writing, she spends her free time with family in Indiana or enjoying the best coffee the city has to offer.